We started our exploration on Lake Garda, Italy’s largest lake, using the town of Bardolino on the southeastern shores as our home base. 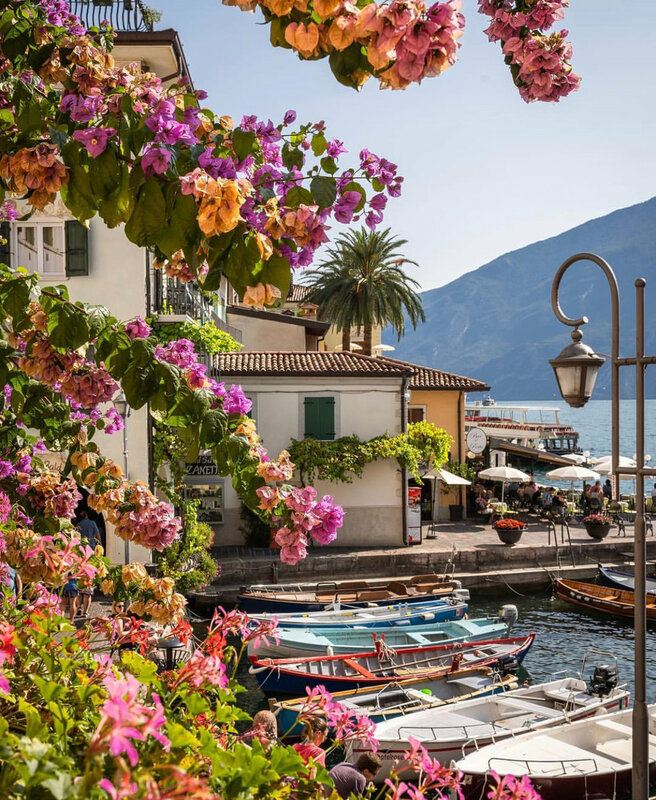 The town of Bardolino itself is a delight with a scenic walkway along the lakeshore with plenty of shops and a variety of restaurants. You can ferry to the south end of the lake to the town of Sirmione where you can discover the Scaligero medieval castle built in the 13th century; a lovely setting on the shores of the lake. As you travel north around the lake, you'll start to encounter the Alps, which make for a stunning backdrop. 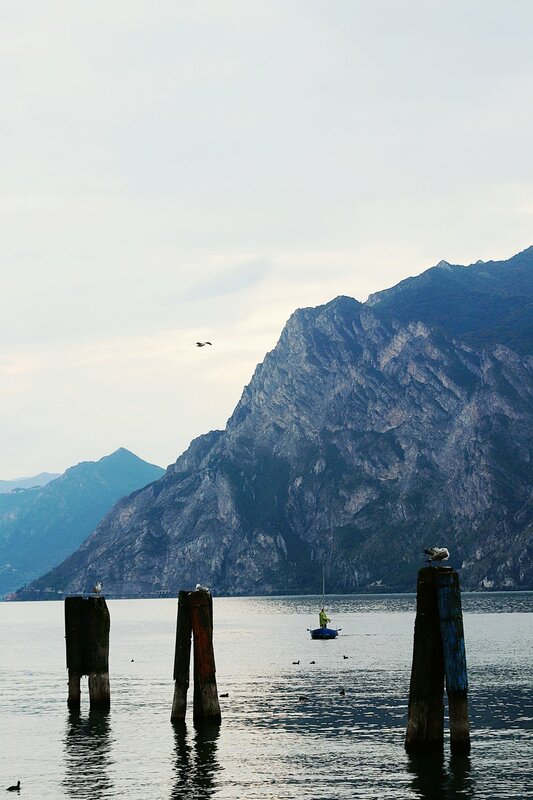 One of my favorite lakeside towns was Limone Sul Garda for its dramatic setting and lovely small town charm. Bardolino is also a DOC so you can start out by tasting their light-bodied red wine. The indigenous grapes here are also found in Valpolicella; Corvina, Corvinone, Rondinella, and Molinara. For a stop at an artisanal winery, I would recommend Poggio delle Grazie. An organic winery who has grown grapes for over twenty years but only producing their own wine the last four. We enjoyed the Rosato Frizzante made with Corvina and Rondinella. They also make a rosé from the same grapes, which had a nice minerality and similarities to those of Provence. 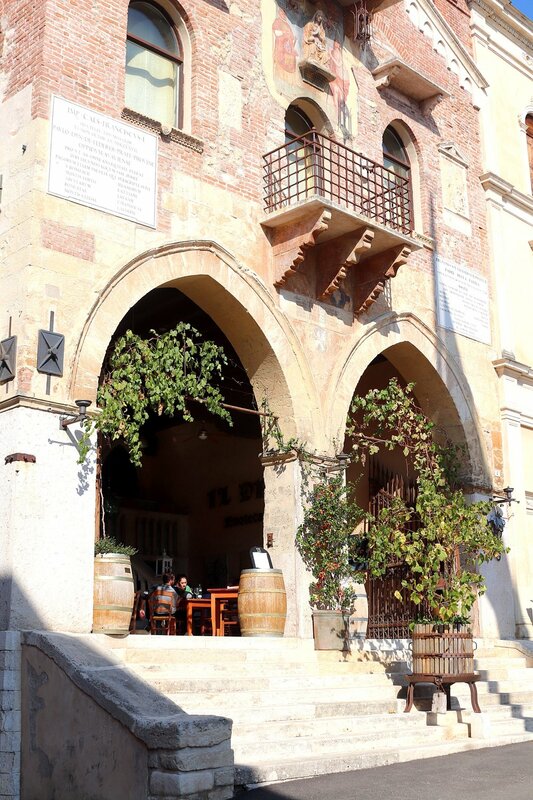 In the town of Bardolino, you can stop into the Cantine Lenotti. It’s a friendly, family run winery producing a wide range of lovely wines. Moving on to the Valpolicella region, Verona makes a great home base. It may be best known as the city of love with Shakespeare setting Romeo and Juliet here, but wine lovers know it for VinItaly. VinItaly is an event, which hosts all the Italian producers to showcase their wines to the world, but there is so much more than wine to put Verona on your visit list. The city has been declared a UNESCO World Heritage Site, with many Roman monuments to see. The arena is the centerpiece, with all its pink marble still intact; it is quite an amazing site. This local pink marble spills out on the streets throughout the city adding to its charm. Beyond the arena venturing into the heart of the town, there are many lovely squares and of course wine bars. One such square is Piazza Erbe centered around this enormous clock tower, here you’ll find lovely outdoor cafes to sit back and take in the views. A little further afield, I would recommend Osteria Caffè Monte Baldo. A local's spot where you can enjoy a glass of wine and these fantastic homemade canapés, a slice of bread with a variety of toppings. If you are in search of older vintages, just down the street is Antica Bottega del Vino, offering one of the most extensive wine lists. 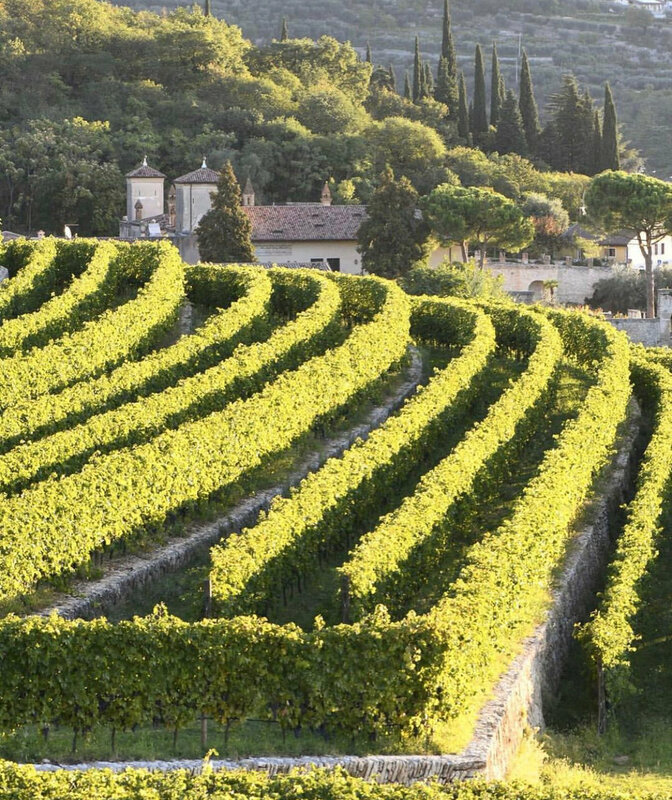 Just north of Verona is one of the three Valpolicella DOC territories called "Classico." Classico means the wine comes from one of three valleys; Negrar, Marano or Fumane. The hillsides here rise and fall more than 600 meters (2000 feet). Picture these rolling hills with terraced vineyards and grapes grown using the Pergola method. This is where the vines provide a canopy to shade the grapes from the heat of the sun and make for a sea of green. Continuing east from Valpolicella, you uncover the Soave DOC where they produce lovely white wines. The whites of Soave are primarily based on the indigenous Garganega grape, but many producers blend in Trebbiano di Soave to enhance the aromatics. The wines are typically light to medium-bodied, with lively acidity. 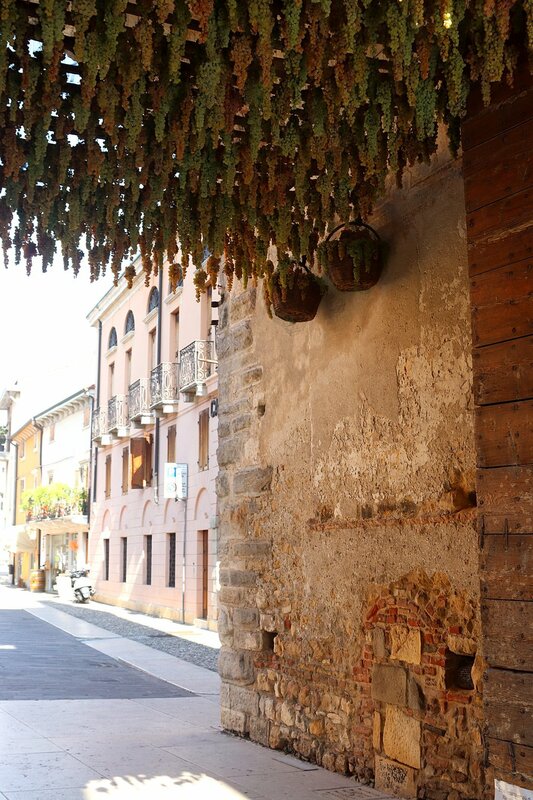 The village of Soave is a quintessential wine town. 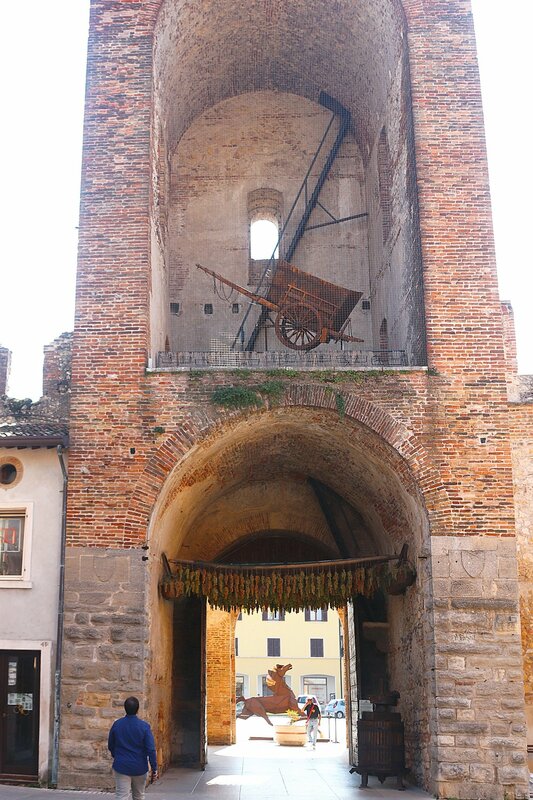 They introduce you to their native grape, Garganega, as you enter the gates of the city. The medieval Castello di Soave dominates the view and looms above the best vineyard sites in the DOCG area. As you wander the main streets, you’ll find many cute wine oriented shops and delightful restaurants to enjoy lunch. 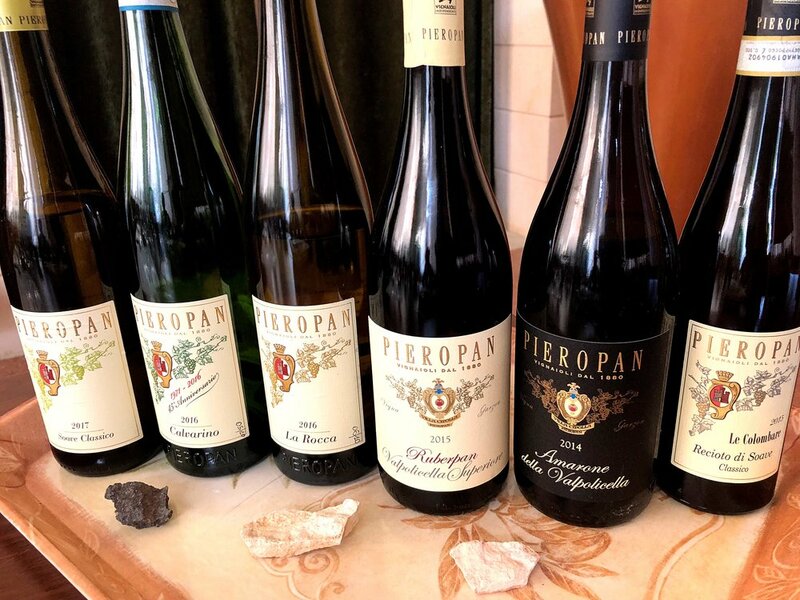 A legendary Soave producer, Pieropan, should definitely be on your visit list. This winery dates back to 1890; Leonildo took over in the late '60s and spent a lifetime as an ambassador of the Soave appellation, raising the bar for quality. He strove for low yields, adhering to the traditional Soave blend of Garganega and Trebbiano di Soave, while still seeking opportunities to innovate. His two sons, who have been involved for some time and have taken over with his passing. Their single-vineyard wines have received numerous high scoring marks and were some of our favorites in our tasting experience. 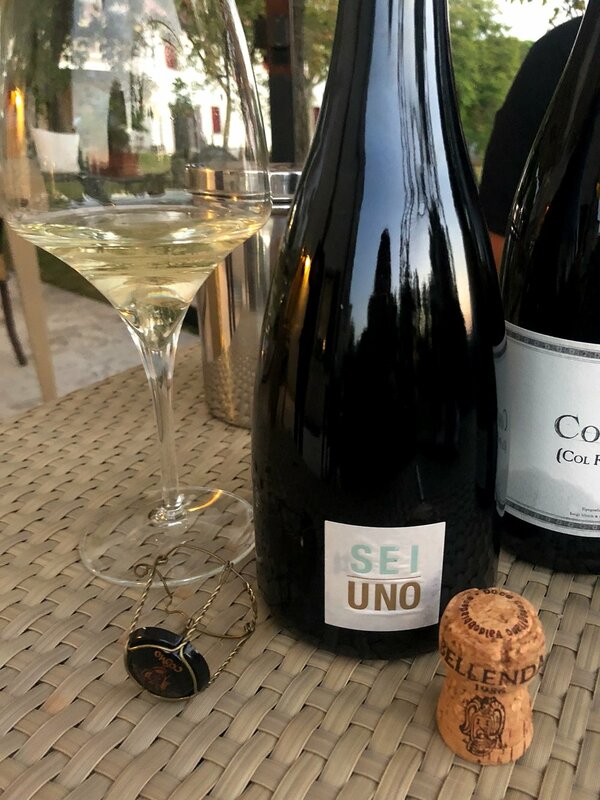 Continue traveling eastward to what is now referred to as “Prosecco Land” it’s an easier reference than Conegliano-Valdobbiadene the actual DOCG. This is the original area concentrated around these two towns. It’s in these hillsides where the Glera grape originated. Prosecco may be thought by some to be a lesser sparkler, but I believe it’s communicating the message that wine is meant for everyone to enjoy. When making Prosecco, most wineries will use the Tank or Charmat method, which provides an excellent value since the second fermentation is done in the tank (versus the bottle), but you will find some producers who produce a Classic method sparkler. An excellent producer to try both methods, and located in this DOCG region, is Bellinda. Our time spent with Luigi, who owns and runs Bellenda along with his brother, goes to show you how small this world can be. You see Luigi spent his childhood summers in the town next to where we live in Southern California. He learned to surf before he learned to speak English. We shared stories sipping Prosecco while watching the sunset over his vineyards. His wife Francesca runs the lovely bed and breakfast where we stayed. While exploring this region, a must visit place is set high above the town of Valdobbiadene where the views of the surrounding vineyards are spectacular. There is an impressive picnic area complete with a sandwich shop, picnic tables, and a Prosecco filled vending machine - you’ll never experience anything else like it! To top off your time in the region you should dine at Da Gigetto restaurant near the town of Maine, a five-star in my book, and with the most impressive wine cellar. Owner Luigi Bortolini started collecting wine in the 1980s and as his collection grew he added room after room to his cellar under the restaurant; now housing some 1600 bottles in various sizes of the best national and international wines. We enjoyed a seven-course tasting menu, and their wine suggestions indeed paired expertly with each course. With each wine came a new glass, fitting to the wine, and something to note they don't serve Prosecco in flutes. From here you are now less than 45 minutes from Venice. The perfect place to end your travels; allow a gondolier to do all the work in showing you around. A fun area for some wine tasting and Venetian tapas, called Cicchetti, is on the western side of the Rialto bridge. One place we enjoyed was, Cantina do Mora, a local hangout dating from 1462, with a lively atmosphere and standing room only.